This is certain to be your favorite center piece. 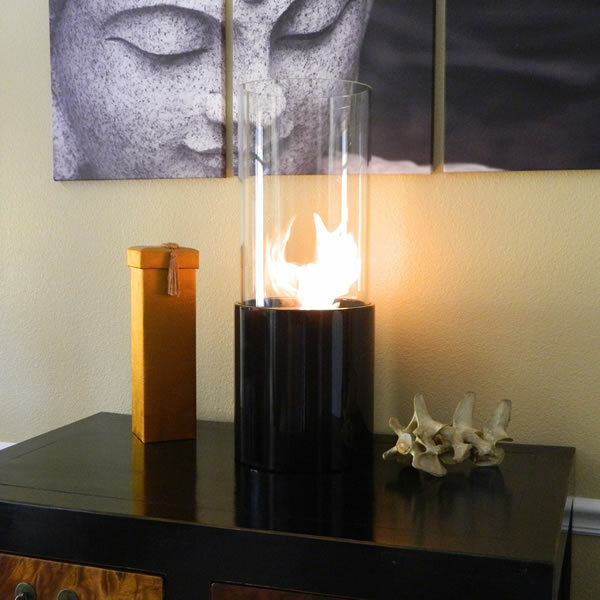 This impressive portable tabletop fireplace stands over 2' tall (25") and features a glossy Noir (Black) base and stunning heavy glass cylinder encasing the flames. The gloss black base is the perfect backdrop for the bright colorful dancing flames. Our Doppio tabletop bio-fireplace may be used indoors or out, however do not leave your fireplace outside exposed to the elements after use. This open ultra modern design allows the beauty and colors of the flames to be enjoyed by everyone. Relax and unwind as you watch the fascinating flames. Perfect for any setting. Ships with snuffer.